Education reform in the US is a hot issue, especially since President Obama made it a priority with his Race to the Top initiative. While politicians scramble to figure out how to fix a broken system, one group of educators is tackling the problem from inside the classroom with ActiveGrade, a new, comprehensive grading system. ActiveGrade aims to give educators a way to monitor the skills that students are actually gaining, rather than give grades “based on a mishmash of the student’s homework grades, effort, behavior, and extra credit.” Rather than using the classic grading system that relies on an accumulation of points, teachers and parents can give feedback and comments as the students are in the process of learning new things. Co-founder Michal Eynon-Lynch chatted with KillerStartups about bootstrapping their education startup and what gets him through the rougher days of starting up a startup. 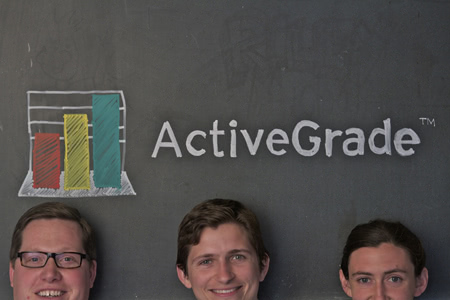 We created ActiveGrade because we didn’t like the passive nature of grading. Typically teachers give students a grade on tests or assignments and that’s it, it’s a one-way street, a static judgement of student performance. We think grading should be more of an ongoing conversation about what the student has learned and what he still needs more practice with. Grades should reflect what the student knows now. That’s how we came to our name – we wanted a name that reflected our belief that grades should be dynamic, responsive, and empowering. Typically we have a check-in. We spend a few minutes reporting on what we did the day before and what we will work on today. It’s a good opportunity for us to ask for feedback or assistance if necessary and to keep each other on track. We started with 3 people. Today we have 5. Remember them!? We’re living them! ActiveGrade started in Riley’s and my second bedroom. As Dan and I were both able to join on full time, ActiveGrade spread onto the dining room table and kitchen counter. Our dining room decorations became whiteboards, chalkboards, and index cards. Dinner was often eaten among and betwixt stacks of paperwork. After a while, we were able to move to Dan’s basement, which provided more room, but less light. This week, we moved into a downtown office. It is something of a delight to be able to leave work and go home. What’s more, there is now a place to store paperwork, so I don’t have to haul folders back and forth! It’s a downright revelation! Other perks include being 2 blocks away from our favorite Indian restaurant, and one block away from milkshakes. [The last time was] this morning. We cry about it and curse at things. When not being overly dramatic, we usually just sigh loudly and keep plugging away at the problem. Possibly eat some candy. Candy? Sounds like a great plan to me! What’s your office environment like? Is it the kind of place where everyone is bumpin’ away to house music or is it more traditional? Dan and Riley often have headphones on – so who knows what they’re listening to. Even so, the atmosphere is quite conversational. We all get focused in on a task, but an interrupting joke or question is always welcomed (and not infrequent). 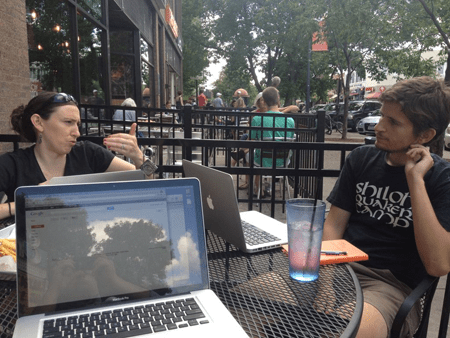 Impromptu meetings to discuss designs and new ideas break up the day and remind us what we do this for. Beer-o-Clock sounds great! Maybe we need that here at KillerStartups. So… How do you picture your company in 5 years? Big, very big… but still cute… with wings. I see our company continuing to be an advocate for meaningful communication and feedback. Hopefully by that time our tools are making an often painful experience (grading) much more useful, enlightening, and even pleasant, for thousands upon thousands of teachers and students. Wings you say? Awesome! So who or what inspires YOU? Role models? Quotes? Running? Video games? Snack food? Give us the deets, dude! Teaching is pretty inspiring, especially when given a fair amount of creative license over how I teach. It’s a great challenge to figure out how to create a structure in which students can learn and become inspired by the material. When ActiveGrade gets discouraging, I like to think about how we are aiding other teachers in making their classrooms stimulating places. I also find Parker Palmer’s writings about education to be particularly inspiring. For the first year-ish, it was self-funded. We secured Angel funding at the top of the year. Living simply helps a lot. Riley and I don’t buy a lot of stuff and cook from scratch. That helped us live off savings for a long time. We also avoided getting an office for as long as possible. 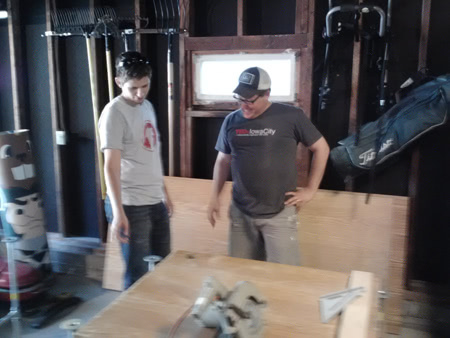 Tomorrow we will be getting materials from a salvage store to build our new office desks. In this way, our office can have funky style, but will be relatively inexpensive. 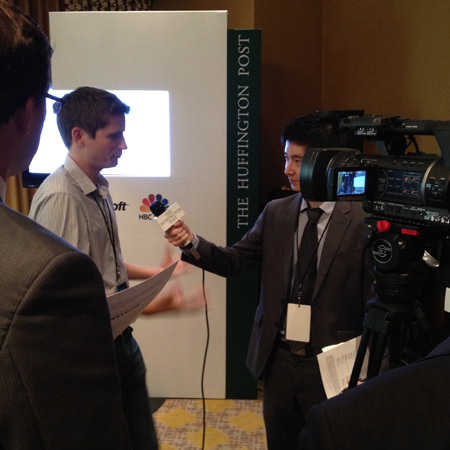 Also, having an excellent programmer and designer on the founding team has been invaluable. If we had to pay the going rate for a programmer, we would have been out of money in a minute. We would have had to spend a lot of time hunting for funding before every building a working prototype. Invisibility, eh? That’s one we haven’t heard before. I’m not sure you can purchase “invisibility” for $500,000 or any amount but it’s a great answer. Do you consider yourself a successful entrepreneur right now? If not, what’s it gonna take to make you feel successful? Hmmm. I am [successful] being an entrepreneur I suppose, which I suppose makes me successful at being one. I’m not making a ton of money at being one, which would maybe make me unsuccessful in some definitions. I think I’m doing a reasonably good job for my first go ‘round and I will probably feel more successful once hundreds of thousands of teachers are using ActiveGrade and feel good about it’s impact on their relationships with students. Google’s various services have been pretty instrumental in allowing us, as a company, to collaborate and communicate from afar. From email, to google docs, to google hangouts, we make use of google apps at almost all points of the day. Oh! Not to mention ActiveGrade is built on Google’s App Engine! I don’t particularly have one. Dan loves Sparrow for making getting his email easy and Instagram for making it fun to share and get pictures. Cats, clearly. They are so soft and make a pleasing, soothing noise when relaxed. They don’t jump up on you, they don’t slobber on you, and they are pretty self-sufficient. Android for me and Riley. Dan’s an iOS man. We fight about it. Some South American country. I’ve spent a fair amount of time in Asia and South American cultures seem very different. So, maybe Peru. I’ve also heard Prague is amazing, so I’d also like to go to the Czech Republic. It changes our relationship to grading. Instead of being about comparisons and static judgements of our success, grading becomes a dynamic conversation about learning and our strengths and weaknesses. In turn, this helps teachers respond to actual student needs, adapting their lessons as needed. Photos courtesy of the founders.